Auto tune pedals are used to enhance the pitch accuracy of your vocals, giving your live performances a polished studio sound. When it comes to singing, even the best singers have off days. You may have a cold, you may be super-tired, other times you may just have a really tough song to tackle and there are just a few notes you aren’t quite hitting. In these cases you could really do with a helping hand. Just a little nudge into the correct pitch. Fear no more. Auto tune pedals are here to the rescue. Note: Clicking the above links will take you to further information, current prices and customer reviews on Amazon. What is a Vocal Auto Tune Pedal? So what is an auto tune pedal? You’re probably more familiar with the idea of pitch correction – well, auto tune is the same thing: it’s a vocal effect used to enhance the pitch accuracy of your vocal take. 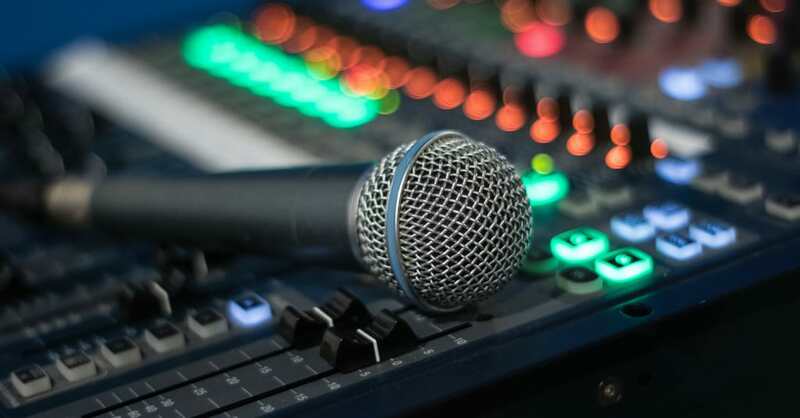 While this is process is typically done ‘in-studio’ by a studio engineer, when you’re gigging you don’t have the same luxury, making your vocals sound less than ideal. Here’s where these pedals come into action: they make your live performance sound as good as in the studio. They often come as foot pedals to be used on stage – or as dedicated rack mount units. The latter is especially suited for a static studio set up. Auto tune/vocal effects processors come in three main formats: pedals, mountable or tabletop. Pedals are the handiest for on-stage use. Simply plug them in between your mic and the PA system and there you have it: control at your feet. You can use them subtly as you sing, and if you’re a guitarist then it will be expected that you’ll be stamping on things. They are also often easy to use, and some of them even contain loopers. Singers who don’t play guitar might prefer mountable processors. These can be mounted onto your mic stand and operated with your fingers. Like the pedals, they are often easy to use and you simply plug it in between your mic and the PA.
Tabletop vocal effects processors are more suited to electronic performers who have decks or similar in front of them. These devices can be added to the table where the mixers are, and can be controlled easily by hand. Any of these three kinds of processors can be used in the studio, though it is usually a device that’s controlled by hand and can be fitted into a rack that is chosen for recording. While there are standalone auto tune pedals, some of the products listed in this article are ‘all-in-one’ vocal processors with multiple effects. Reverb adds depth to any instrument, especially voice, as it’s very rare that a singer will record their vocals without reverb, and it’s equally rare to perform on stage without any. Normally, this is controlled by the sound engineer, who – as we established earlier – is unlikely to know your preferences or requirements. Delay, doubling and vocoder effects are also common, which are useful if you’re an electronic or psychedelic singer. EQ is another feature to look out for. Often your voice will sound a bit muffled if there is too much low end, or a bit tinny if there’s too much high. Having your own EQ device can really make a difference when it comes to ensuring that your voice sounds like your voice. A lot of vocal processors also include a harmonizer function. If you’re in a band with people who are a bit unsure about singing, the ability to add a harmonized line at the switch of a button can remove all of the pressure. Solo performances can also be massively enhanced by harmonizing effects, to bring out choruses or just to make the act more interesting. While dedicated harmonizer pedals are available, having a harmonizer function as part of an effects pedal is handy too. The Mic Mechanic is a versatile little vocal processor with an amazing amount of features. There are reverbs, delays, auto tune options and you can also apply compression, a noise gate and EQ settings. It’s perfect for singer-songwriters who play guitar, as it looks and functions as a stompbox. This pedal gently nudges any flat or sharp notes to their nearest chromatic pitch, so it will suit the singer who wants to keep it as natural as possible. It won’t suit the electro artists who want to Robotify themselves, but there are some cool delay and reverb settings here to further enhance your vocal. The Boss VE-20 will fix your pitch in a way that’s either subtle or in-your-face, depending on your requirements. It’s easy to use and control and, like the Mic Mechanic, you switch it on with a stamp. As well as pitch-correcting, this pedal has the ability to create harmonies, add reverb and even loop. It’s a great toy for the creative singer. This advanced and professional product is for the singer who isn’t tech-shy, and wants top results. It’s great in the studio as well as on stage and features a gate, compressor, EQ and a de-esser, and it also has a built-in doubling effect. It also has a microphone modeling function which simulates a variety of high-quality microphones, and there’s also MIDI options. This model is for the singer who is also tech-mad, and keen to get the best possible results. The Roland AIRA is perfect for electronic musicians who want heavily processed vocals. There are reverb, auto tune, vocoder and harmonising options, and you can make your voice sound like a synth, a bass or the classic robot voice feature. It can also be used as an audio interface, so is great for home recording projects. All of the sounds you exhibit through this little box are of exceptional quality, this is a truly professional piece of kit. If you’re looking for a more natural ‘fix’, this won’t be right for you, but electro-musicians, go wild! There aren’t functions like gates or compressors here, so if you require those then you’ll have to combine this with another processor. TC Electronic are offering these cool, compact little pedals at the moment which work like guitar pedals in that they have just one function. 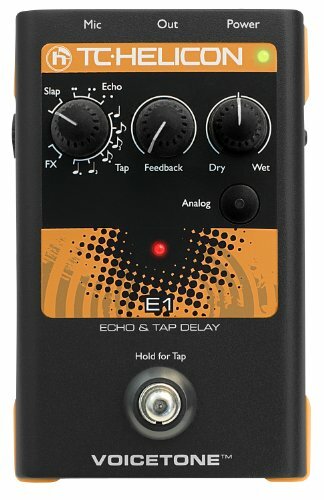 The one we’ve chosen here is the E1 – the Echo pedal – but there also exists the R1, H1, X1 and D1. These little models are easy to use, offer excellent quality and can be controlled with the tap of a foot. Perfect for the singer who loves guitar pedals and the options they provide. So, Which Should I Buy? If you’re after an easy to use, budget-friendly, simple pedal, then the TC Electronics Singles VoiceTone C1 is the obvious choice here. Not only can it be slotted into your pedalboard, but your guitar can go through it and even help to guide your vocals into the right pitch! 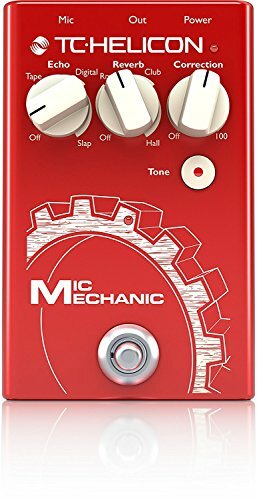 If you’re not a guitarist, the TC Helicon Mic Mechanic might suit you more, which has the benefits of reverb, delay and auto tune, as well as a compressor, noise gate and EQ. Whilst it’s less controllable than some of the others, it’s also the easiest to control as you can do so using your foot on stage. 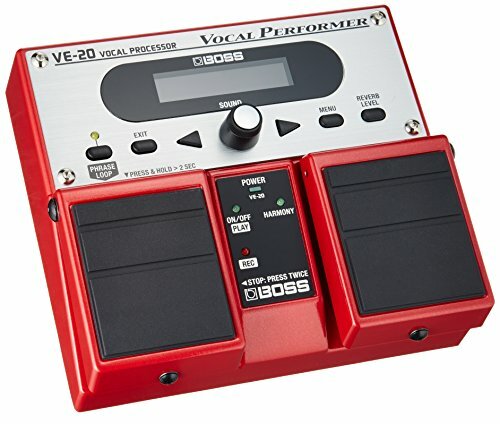 If you’re looking for something a bit more complex, which offers reverb and delay features alongside its pitch shifting, the Boss VE-20 will cater for your creative side! 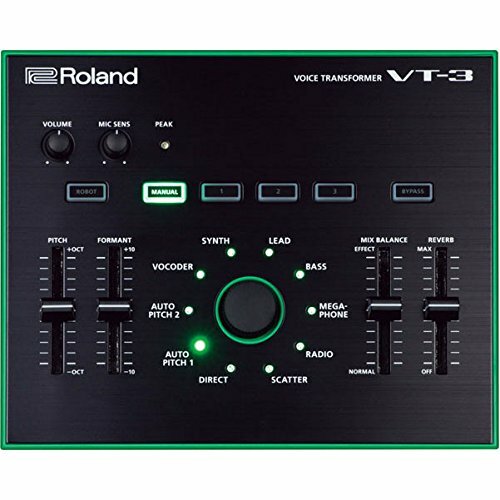 If you’re looking for something which doubles up as an audio interface, and you’re an electro musician, the ​Roland AIRA Series VT-3 Voice Transformer is the one for you. Roz is a music teacher and our go-to person for anything music theory! When she’s not teaching or writing for Zing, Roz writes and plays in alternative/ psyche /art rock band The Roz Bruce Infusion. Hey, I'm Ged. Our mission at Zing is to create the best free online learning resource for musicians. Zing Instruments is a participant in the Amazon Services LLC Associates Program, an affiliate advertising program designed to provide a means for us to earn fees by linking to Amazon.com and affiliated sites.